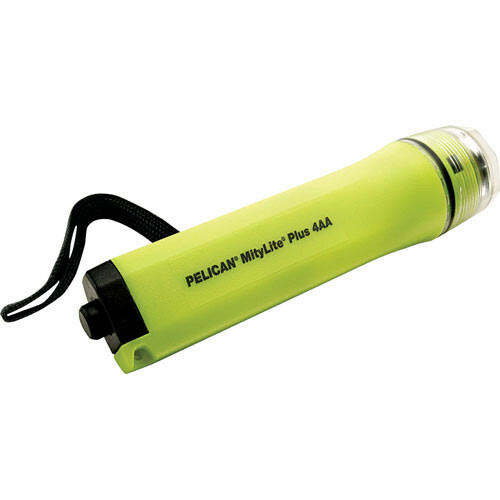 The yellow Pelican 2430 MityLite 4 AA Xenon Flashlight is a practical and convenient light. It features a high-powered xenon lamp that blasts approximately 87 lumens for up to 3.5 hours of consecutive battery burn time. This MityLite is water resistant and is constructed of extremely rugged ABS. The light is very powerful and lightweight and comes with a multifunction mounting clip for attachment to a work helmet. It has a tailcap switch for easy one-handed operation as well as a separate replacement lamp for easy maintenance. Box Dimensions (LxWxH) 8.3 x 5.4 x 1.1"
2430 MityLite 4 AA Xenon Flashlight (Yellow) is rated 4.0 out of 5 by 1. Rated 4 out of 5 by TonyC the Audiophile from Small Flashlight - Big Light Although it may not be the smallest flashlight among compacts, it is portable and cast a light equivalent to its bigger rivals. how do you replace the bulb? how to change batteries ?